Are you in holiday décor mode? If so, consider creating this wreath. It combines some down home country cowgirl charm with a festive spirit. 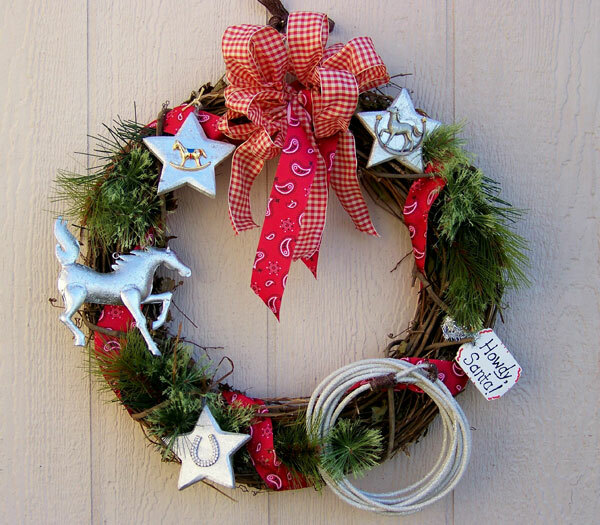 Depending on the supplies available at your local craft store, plus what you might have in your own collection of horse-themed ornaments, your wreath may look quite different from the one shown here. So use these directions as a basic guide. Ultimately, though, you’ll end up with a wreath that will welcome both Santa and your guests. This rustic wreath needs a few cheery decorations, but they must complement the theme. Beware of using your treasured glass horse ornaments, as they could end up broken. Instead, search for durable items, even if they need a little bit of help to look seasonal. 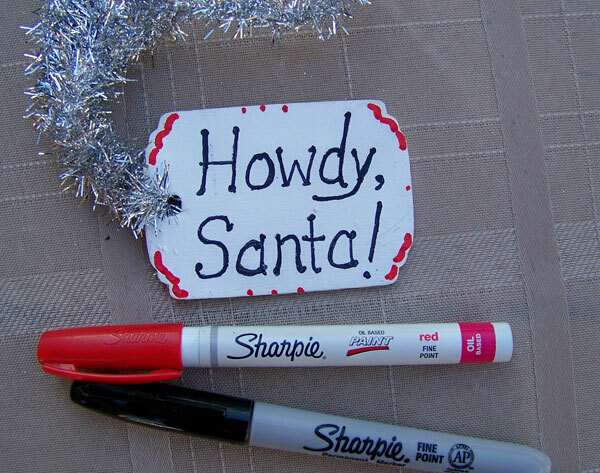 For example, we used plain wooden stars, sprayed them with silver paint, and then glued on various horsey doo-dads. The same process transformed a turquoise-colored tin horse into a glitzy silver steed. Glitter also helps, too! Step 1: The flexible glitter rope is already coiled like a lariat. To look realistic, it just needs a honda, the little loop at one end that forms the lasso. To create the honda, bend an oval loop at one end, and then wrap that loop around the adjacent coil of the rope. Hold your honda together with masking tape. Now wrap brown ribbon over the tape. 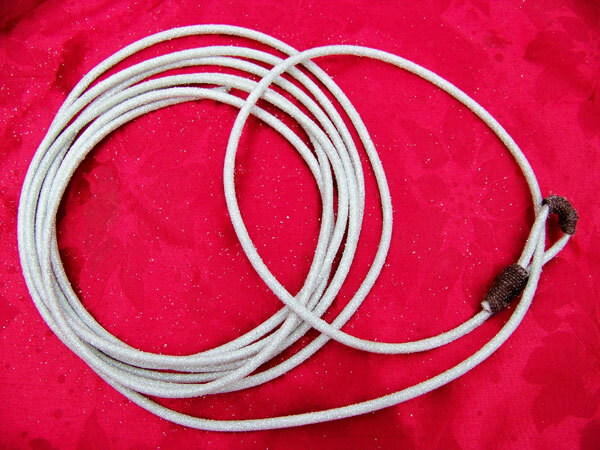 It’s a great substitute for the leather or rawhide a cowboy uses. Use your glue gun to secure the cut ends of the brown ribbon. Set aside the finished lariat. Step 2: Add bits of greenery by gently tucking the stems under and through the woven grapevine. Use your wire nippers to trim off extra long stems. 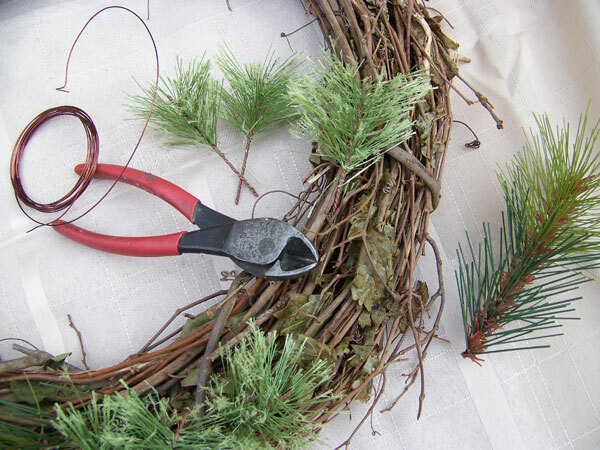 Use craft wire to hold in place large or heavy greenery. Lay sections of wire discreetly across the greenery. Pull it snug (but not too tight), and wrap the wire around the wreath. Twist the ends of the wire together on the backside. Be sure to turn any wire ends downward so they don’t leave scratch marks. Step 3: You should have two rolls of ribbon; at least one must be wire-edged. One roll will be used to wrap around the wreath and the other (the wire-edged roll) will primarily form the bow. Begin with the wrapping ribbon, which is a red bandana print here. Gently fold it into thirds. Cut off one third and set it aside. 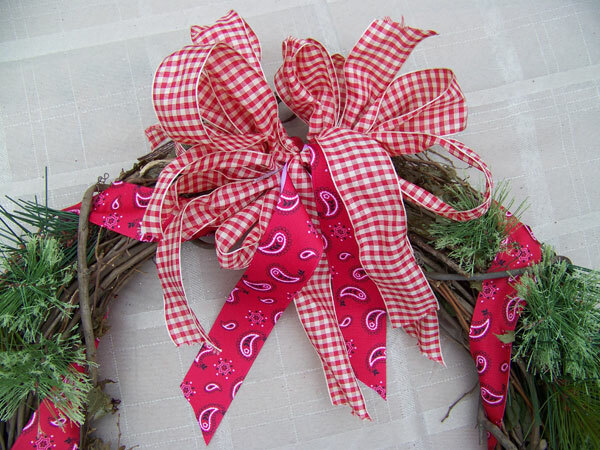 Wrap the remaining ribbon around the wreath in about the same way you’d wrap a horse’s leg. When you reach a thick branch on the grapevine, weave the ribbon underneath it and continue. Eventually you’ll reach the other end of the ribbon. If necessary, adjust the ribbon so you’re able to tie the two ends together in a square knot. You can either allow the ribbon tails to hang down or trim them off. 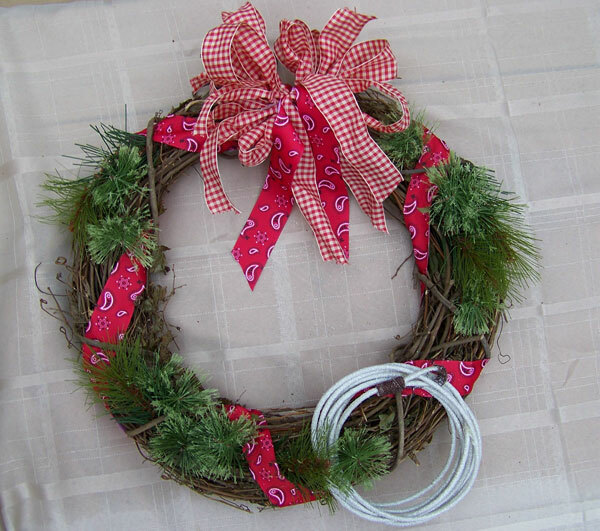 Step 4: Make a bow for your wreath with the wire-edged ribbon. The wire edge allows you to fluff up the bow and make it fuller. Making a bow is simple: Loop the ribbon back and forth against the palm of your hand until you run out of ribbon. Pinch it together in the center and then tie a long piece of twine or raffia around the center and voila! (For further instructions, see the directions for the autumn wreath). 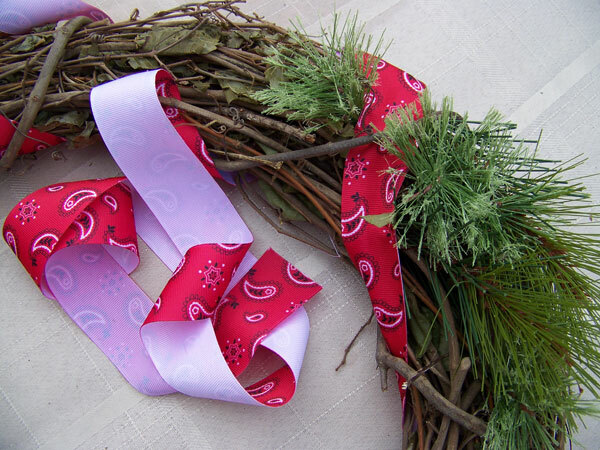 Attach the completed bow to the wreath by tying it on with the remaining twine. Step 5: Affix the lariat to your wreath with craft wire. The lariat is a focal counterpoint to the bow, so it should be placed beneath, or diagonally across from, the bow. Once the lariat is in place, add the decorations. It’s up to your discretion whether wire, raffia, narrow ribbon or twine is the best choice to tie the decorations onto the wreath. Step 6: Make a hanger for your wreath with the narrow brown ribbon. Thread the ribbon through some of the thicker branches of the grapevine as you continue all the way around the entire wreath. Make a square knot it on the backside. Allow some space for a loop, then tie another knot and your hanger is done. If you have enough ribbon left, you can get fancy and add a little bow. Step 7: Paint your tag. Once it’s dry, print a short message with a permanent black marker. If you’re unsure of your printing skills, lightly trace your lettering first with a pencil, then go over that with your permanent marker. Attach the tag in a prominent place where it’s clearly visible. That’s it! 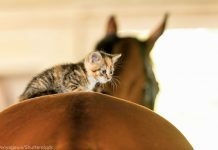 You’ve added a decorative element to your horsey holiday, and you get the satisfaction of making it yourself.